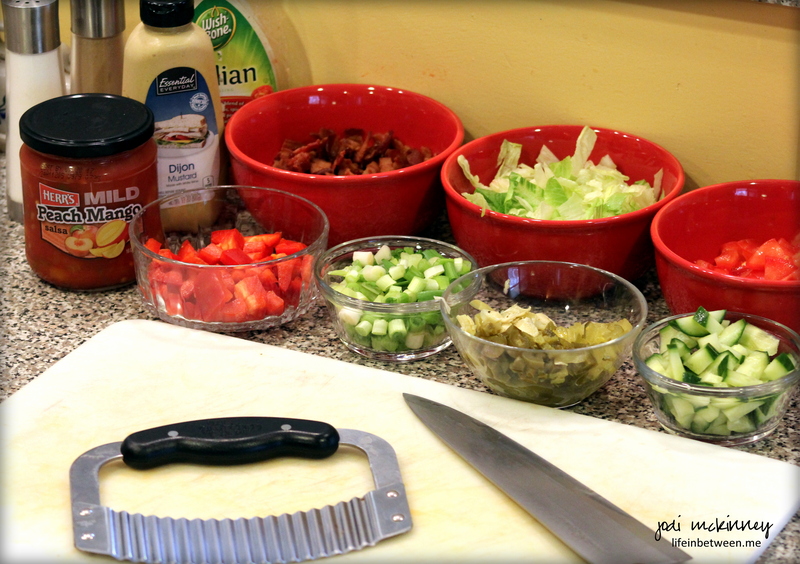 This past Sunday, my son Nick took over the kitchen for dinner and made us his amazing Chopped Chicken & Veggie Wraps. Nick likes anything chicken and anything that can be wrapped up in a tortilla and eaten by hand. This recipe requires a bit of chopping ahead of time, but throws together quick and easy and tastes so delish! Starting with marinated grilled skinless, boneless chicken breasts and adding your favorite veggies makes for a healthy, quick, and oh so yummy dinner or lunch or anything in between! The secret is in the double chopping. Once you pile all the chopped ingredients together, you chop again. 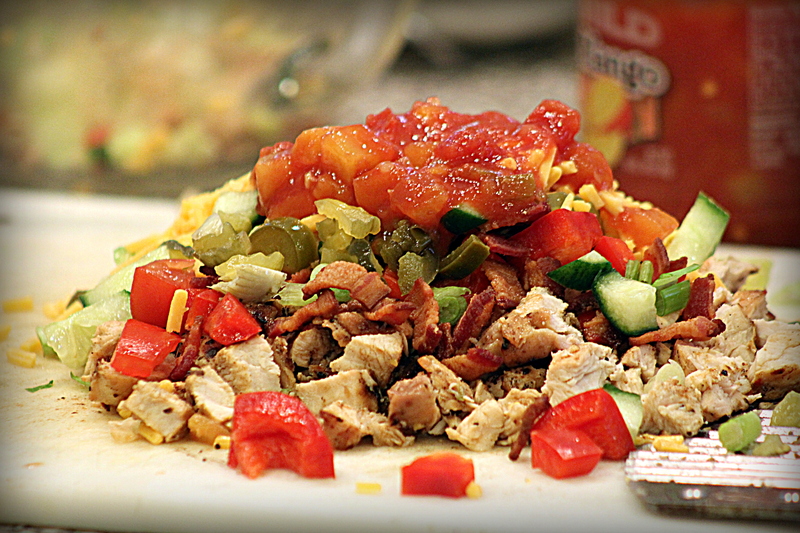 And the thing that really kicks this wrap up for me is the Peach Mango Salsa! OOOOO LAA LAA! Throw in anything you like, but here is how Nick made these for us. Marinade chicken in Italian salad dressing for approximately 24 hours in Ziploc bag in refrigerator. 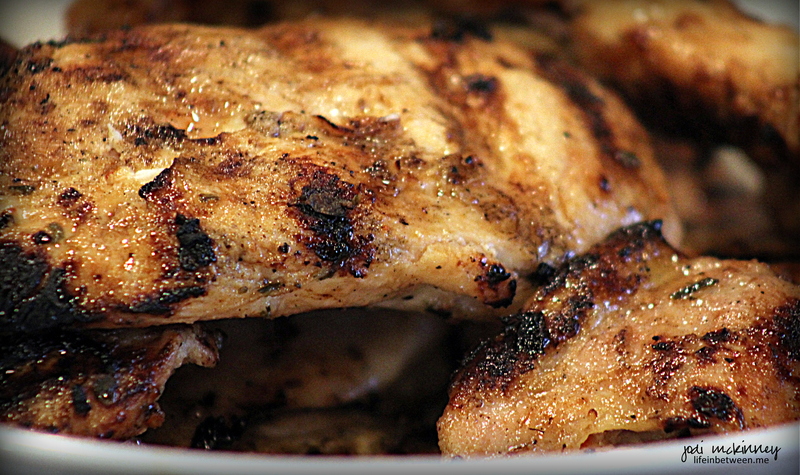 When ready to eat, grill chicken and chop. Chop all veggies and ingredients you plan to use. To assemble, heat flour tortilla in microwave for 20 seconds to make more pliable for wrapping and prevent cracking. Heat George Foreman Grill or Grill Pan. 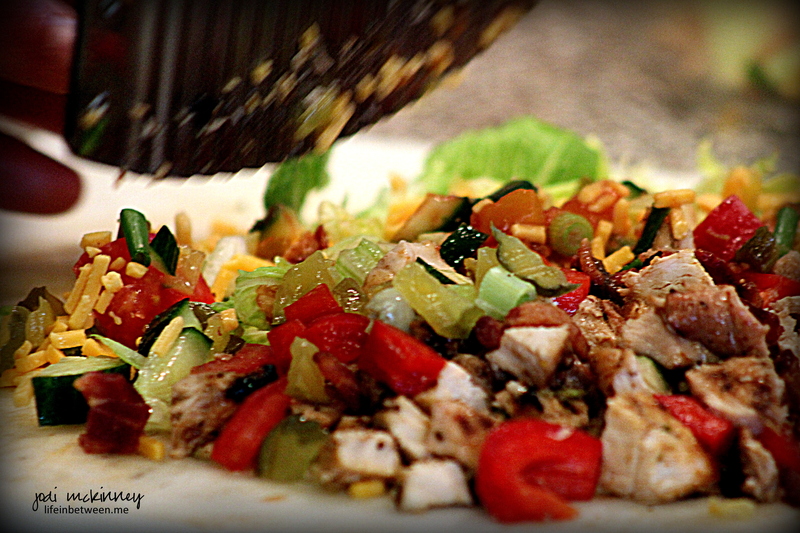 Place all ingredients together for each wrap, top with a heaping spoon of salsa, and re-chop all together. Mound in center of warmed tortilla and wrap tightly. Place on grill to heat, crisp, and seal. Oh my gosh, Jodi, this looks amazing! They look and sound so delicious! The best part is that Nick cooked them for you!! I definitely will have to try this. Your photography is amazing too! Wow! This looks really good! I haven’t taken my lunch and I am wishing now that I have this delicious wrap in front of me. Oh Jhuls – it was so good – I’m getting hungry now too!! lol! And a little bacon doesn’t hurt either! LOL! They were DELISH!!!!! Yay, ok, I’ll look it up and see … Gem wraps is what we have now but there’s another one that’s really easy to find in mainstream stores and I’ll check back on that one when I can scratch my foggy brain and remember it. Any thought is straining the cells til mid-May lol! Vic really likes it tho and I know Nick has thought about reducing gluten so, happy to help! This meal looks scrumptious Jodi!! Oh wow, this is great, I’ll make it this week. Thank you Jodi and Nick! Yay! Hope you enjoy as much as we did Sharon! Hugs! Wow great job to Nick! Lucky you Jodi! Wow, you are sooo lucky, looks fabulous too!! I think it’s a guy thing! I want this soooo badly I’m drooling! Funny how the boys make the great food! Thank’s for asking about the Wedding !! We had a great Celebration, Best time, and I am a Good tired out!!.. A little weepy here and there, but with happiness. He really has come a long way!! Cheers to cinco de mayo!! 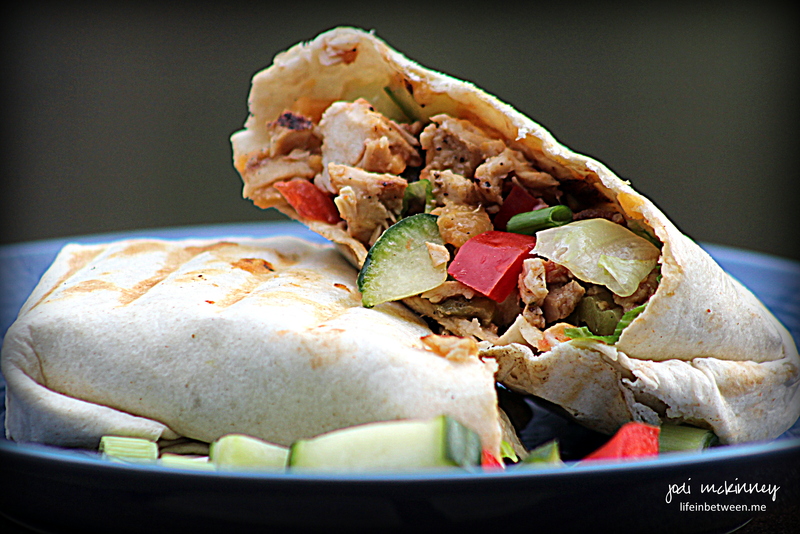 This is my kind of perfect dinner, lots of veggies and all wrapped up in a tortilla! Lucky you! This looks beyond delicious and just may be my Saturday night meal! Thank you, Jodi! It looks like Nick is a good cook! That’s wonderful that he’s learned to cook! Our youngest son will go to college in the fall but doesn’t cook. I think he knows how to fry eggs. That is better than Nick was at that point! 🙂 LOL! Clearly, Nick inherited you cooking skills! That looks delicious, and I’m going to share this recipe with my daughter, too! He really has learned a lot recently. He is finally interested in learning 🙂 Enjoy ann! I agree, the peach mango salsa brings the entire wrap together. Looms delicious.